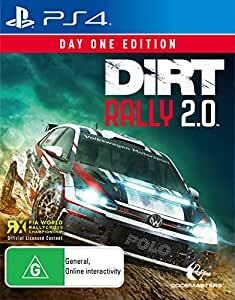 DiRT Rally 2.0 - Day One Edition Includes the stunning Porsche 911 RGT Rally Spec along with early unlocks for the Fiat 131 Abarth Rally and Alpine Renault A110 1600 S. DiRT Rally 2.0 dares you! Carve your way through a selection of iconic rally locations from across the globe, in the most powerful off-road vehicles ever made, knowing that the smallest mistake could end your stage. You will need to rely on your instincts with the most immersive and truly focused off-road experience yet, including a new authentic handling model, tyre choice and surface degradation. Power your rally car through real-life off-road environments in New Zealand, Argentina, Spain, Poland, Australia and the USA, with only your co-driver and instincts to guide you. Race on eight official circuits from the FIA World Rallycross championship, complete with licensed Supercars and support series. Develop your team and cars around race strategies, and progress through a varied selection of Events and Championships in both a single player Career Campaign and a competitive online environment. Features: Over 50 Of The Most Powerful Off-Road Cars Ever Built - Tear through environments with an iconic roster of historic and modern-day rally cars, including the 1995 Subaru Impreza, VW Polo GTI R5, Nissan Datsun 240z, the Audi Quattro S1 E2 and the AudiS1 EKS RX quattro. 6 Real Life Rally Locations - Take the wheel through the stunning environments of New Zealand, Argentina, Spain, Poland, Australia and the USA. Feel Your Race - Improved handling, surfaces, fallibility and environments deliver the most authentic and focused off-road experience ever. The Official Game Of The Fia World Rallycross Championship - Race at Barcelona, Montalegre, Mettet, Loheac Bretagne, Trois-Rivieres, Hell, Holjes and Silverstone in a multitude of different series. Develop Your Own Team - Build your own team and craft its identify. Expand your own garage of vehicles, manage a roster of staff and develop your Service Area facilities. Tuning - Tune your vehicle to suit your driving style and environmental characteristics. Alleviate wear and tear by configuring each car's set-up, and upgrade your parts to ensure your vehicles are ready for whatever challenge lies ahead. Get Competitive - Race the entire DiRT Community in Daily, Weekly and Monthly Challenges, with worldwide leaderboards and events.